IMPORTANT: After checking out with PayPal, click on the “Return to [email protected]” link that will appear just below your transaction ID on your PayPal web page. This will allow you to complete your transaction, download your products or view special information about your order. 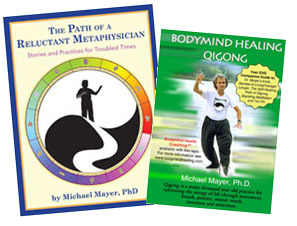 The Path of a Reluctant Metaphysician and Bodymind Healing Qigong DVD combination package. Normally a $52.45 value. Black t-shirt in 4 different sizes: small, medium, large, and extra large. "The Path of the Reluctant Metaphysician" and "Transforming Troubled Timed through Metaphysical Practices" with logo on front. "Are you a Reluctant Metaphysician?" on the back. 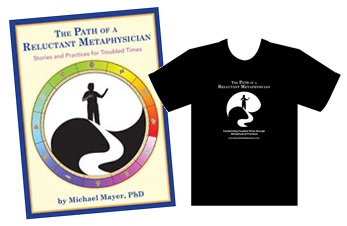 Get the book, The Path of a Reluctant Metaphysician, and the black t-shirt for $5.00 off.